Sickle cell disease is a group of disorders that lead to deformation and break down of red blood cells. Washington: A new study sheds light on how sickle-cell disease occurs when deformed red blood cells clump together, blocking tiny blood vessels and causing severe pain and swelling in the affected body parts. Sickle cell disease, also known as sickl -cell anemia, is a group of disorders that lead to deformation and break down of red blood cells. 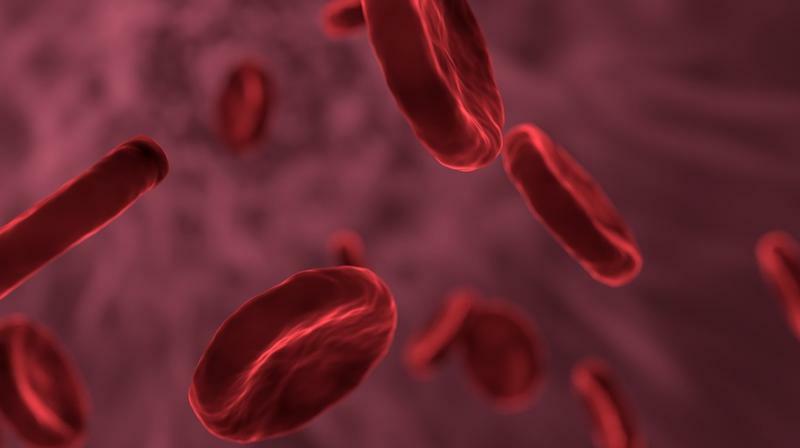 Researchers at the Massachusetts Institute of Technology (MIT) analysed blood from patients with sickle-cell disease and revealed the process of cell clumping. Known as vaso-occlusive pain crises, the findings represent a step towards being able to predict when such a crisis might occur. "These painful crises are very much unpredictable. In a sense, we understand why they happen, but we don't have a good way to predict them yet," said Ming Dao, a principal researcher and one of the senior authors of the study. The researchers found that these painful events are most likely to be produced by immature red blood cells, called reticulocytes, which are more prone to stick to blood vessel walls. Patients with the sickle cell disease have a single mutation in the gene that encodes hemoglobin, the protein that allows red blood cells to carry oxygen. This produces misshapen red blood cells: Instead of the characteristic disc shape, cells become sickle-shaped, especially in low-oxygen conditions. Patients often suffer from anemia as the abnormal hemoglobin can't carry as much oxygen, as well as from vaso-occlusive pain crises, which are usually treated with opioids or other drugs. To probe how red blood cells interact with blood vessels to set off a vaso-occlusive crisis, the researchers built a specialised microfluidic system that mimics the post-capillary vessels, which carried deoxygenated blood away from the capillaries. These vessels, about 10-20 microns in diameter, are where vaso-occlusions are most likely to occur. The microfluidic system is designed to allow the researchers to control the oxygen level. They found that when oxygen is very low, or under hypoxia, similar to what is seen in post-capillary vessels, sickle red cells are two to four times more likely to get stuck to the blood vessel walls than they are at normal oxygen levels. When oxygen is low, hemoglobin inside the sickle cells forms stiff fibres that grow and push the cell membrane outward. These fibres also help the cells stick more firmly to the lining of the blood vessel. The researchers also found that in patients with sickle cell disease, immature red blood cells called reticulocytes are most likely to adhere to blood vessels. These young sickle red cells, just released from bone marrow, carry more cell membrane surface area than mature red blood cells, allowing them to create more adhesion sites. "Blood cell adhesion is indeed a very complex process, and we had to develop new models based on such microfluidic experiments. These adhesion experiments and corresponding simulations for sickle red cells under hypoxia are quantitative and unique," said George Karniadakis, senior author of the study. The findings appeared in the Proceedings of the National Academy of Sciences.